Chris Hemsworth has terrible luck with navigation. In his latest flick In the Heart of the Sea, he and his crew are stranded at sea for 90 days. In a funny segment for The Tonight Show Starring Jimmy Fallon, the actor loses a “scooter sleigh” race after going in the wrong direction. 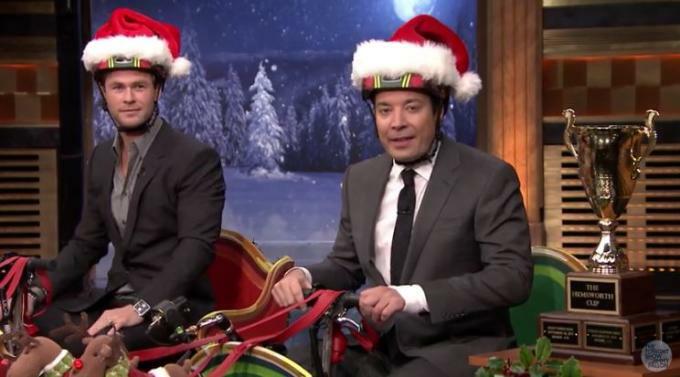 The rules were simple: He and Fallon would race in customized scooters through a Christmas-themed course that includes the ghosts of their old headshots and a pair of children engaged in a mini snowball fight. The winner would receive the coveted “Hemsworth Cup” which, sadly, is not a real thing. Judging from the results of the race, he forgot everything he learned in Rush. Watch how it all unfolds in the video above.